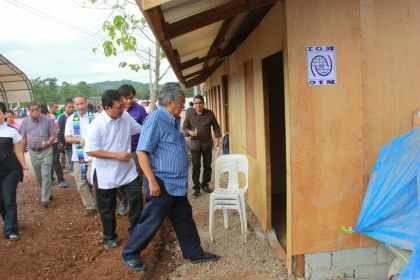 CAGAYAN DE ORO CITY, Jan. 30 (PIA) -- The Joint Foreign Chambers (JFC) is optimistic that the Philippines will post an economic growth of six percent in 2012 due to higher investments. John Casey, president of the Australian-New Zealand Chamber of Commerce of the Philippines, said the additional effects of the now fast-tracked rollout of government spending programs and public private partnership (PPP) program can also boost the economy. "We must pick up the pace of foreign direct investment (FDI) to sustain the historically high economic growth in 2010. The Philippines has never achieved the levels of FDI that Indonesia, Malaysia, Singapore and Vietnam have achieved," he said during the Arangkada forum on Thursday. Casey expresses hope that last year's high level of Board of Investments (BOI) approvals and the record inflow of $1 billion in foreign funds into the Philippine Stock Exchange in the last two months are indicative of increasing levels of FDI in 2012 and in the coming years. He said developing the identified seven big winner sectors can also generate more investments to the country. These sectors are infrastructure, agribusiness, business process outsourcing, creative industries, manufacturing and logistics, mining; and tourism, medical travel and retirement. The JFC believes that developing these seven key sectors can generate $75 billion in FDIs and ten million jobs over the next ten years. "The Asian Century is well underway, and the Philippines must elevate its position to benefit from the foreign investment opportunities in the Seven Big Winners industry sectors. This also comes at a time when the impacts of multiple free trade agreements are starting to be felt across participating economies," he said. For his part, Hubert d'Aboville, president of the European Chamber of Commerce of the Philippines, said they are hopeful that the record high levels of over $8 billion new investments approved last year will be realized in construction and job creation in 2012. He also cited the allocation for economic services to support the administration's drive for inclusive and sustained economic growth. The JFC listed several factors in attracting more FDIs into the country. These include good infrastructure, sound economic and pro-business policies, internationally competitive costs and corrupt-free governance and commercial practices.